But not “funny ha-ha”. More like, “funny how that neck is clearly impossible.” I mean, really. This is another shot from the Museum of Osteology in Oklahoma City. A few hundred more posts like this and I’ll be done. For more flamingo-related weirdness, check out Casey Holliday’s work (with Ryan Ridgely, Amy Balanoff, and Larry Witmer) on the wacky blood vessels in flamingo heads. Unfortunately, Holliday et al. found no evidence of the antigravity generators that are obviously present in flamingoes somewhere. So there’s more work to be done here. Kinda makes me sad, to ponder all of the sweet soft-tissue adaptations that extinct organisms must have had, that we will probably never know (enough) about. At least we have freaks like this around to remind us. It is probably no surprise, given my proclivities, that I have more to say about the neck than about anything else. So unless I develop an abnormal curiosity about and mastery of, say, sauropod foot anatomy in the next few days, this will be the longest post in the series. As with the head, the neck of the Apatosaurus maquette illustrates a lot of interesting anatomy. Some of this is unique to Apatosaurus and some of it is characteristic of sauropods in general. I’ll start with the general and move toward the specific. As we’ve discussed before, the necks of most sauropods were not round in cross section (see here and here). The cervical ribs stuck out far enough ventrolaterally that even with a lot of muscle, the neck would have been fairly flat across the ventral surface, and in many taxa it would have been wider ventrally than dorsally. 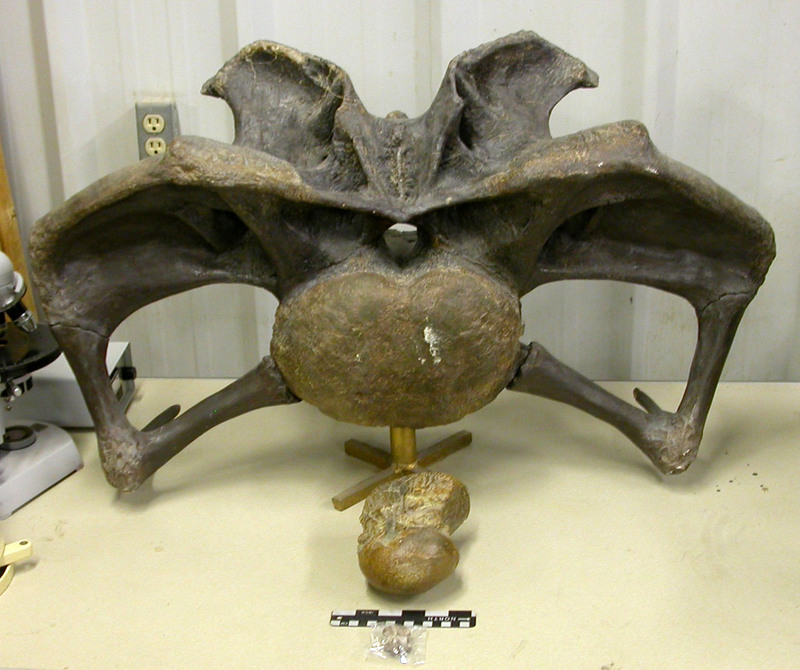 The non-circular cross section would have been exaggerated in Apatosaurus, which had simply ridiculous cervical ribs (photo above is from this post). The widely bifurcated neural spines would also have created a broad and probably flattish surface on the dorsal aspect of the neck. The extreme width of the vertebrae and the cervical ribs created a very broad neck base. As in Camarasaurus, the base of the neck was a substantial fraction of the width of the thorax (discussed here). Consequently, the cervico-thoracic junction probably appeared more abrupt in narrow-necked taxa like Diplodocus and Giraffatitan, and more smoothly blended in Apatosaurus and Camarasaurus. All of these features–the non-circular cross-section, the flattish dorsal and ventral surfaces, the wide neck base blending smoothly into the thorax–are captured in the Apatosaurus maquette. 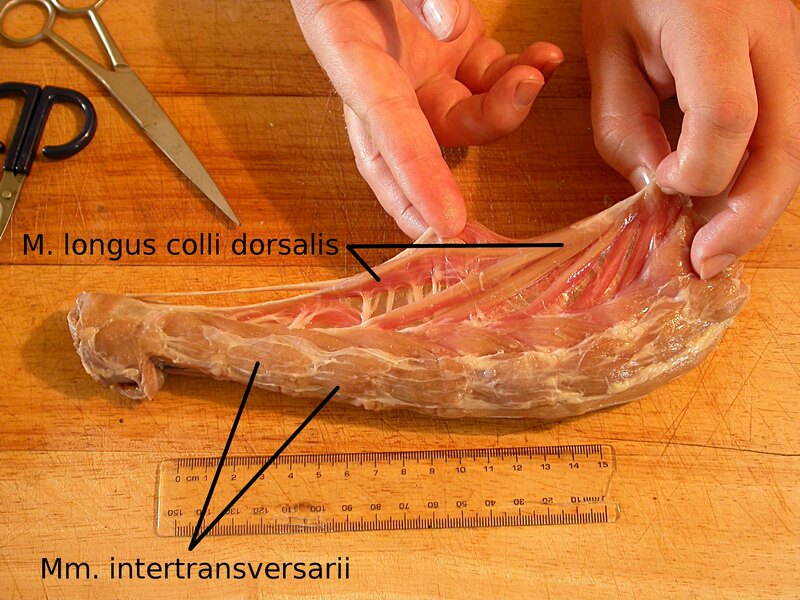 The ventrolateral ‘corners’ of the neck have a ribbed appearance created by, well, ribs. Cervical ribs, that is, and big ones. In contrast to most other sauropods, which had long, overlapping cervical ribs, diplodocoids had short cervical ribs that did not overlap. But in Apatosaurus they were immense, proportionally larger than in any other sauropod and probably larger than in any other tetrapod. What Apatosaurus was doing with those immense ribs is beyond me. Some people have suggested combat, akin to the necking behavior of giraffes, and although I haven’t seen any evidence to support that hypothesis over others, neither does it strike me as far-fetched (an important nuance: giraffes use their heads as clubs, clearly not an option for the small-headed and fragile-skulled sauropods). Whatever the reason, the cervical ribs of Apatosaurus were amazingly large, and may well have been visible from the outside. 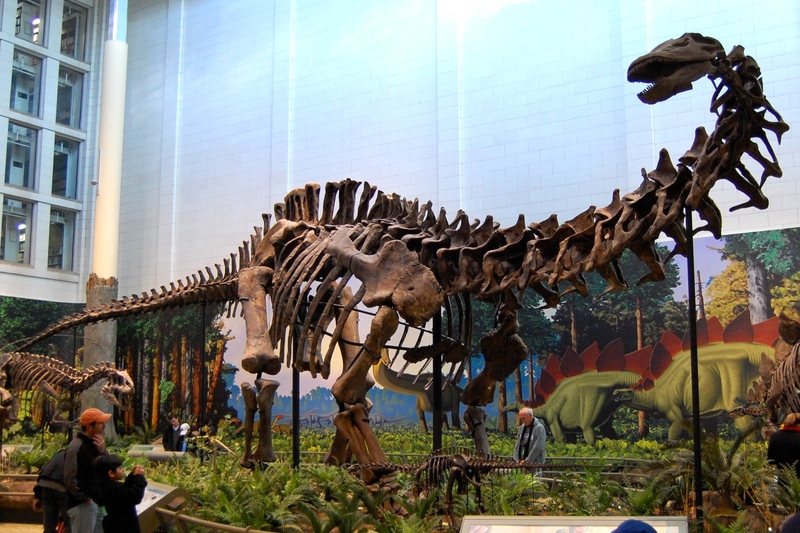 Mounted skeleton of Apatosaurus louisae in the Carnegie Museum, from Wikipedia. Now this brings me to a something that, although not universal, has at least become fairly common in paleoart. This is the tendency by some artists to render (in 2D, 3D, or virtually) sauropods with dished-in areas along the neck, between the bony loops where the cervical ribs fuse to the centra. I am going to be as diplomatic as I can, since some of the people who have used this style of restoration are good friends of mine. But it’s a fine example of shrink-wrapped dinosaur syndrome, and it simply cannot be correct. Adjacent cervical ribs loops in sauropods would have been spanned by intertransversarii muscles, as they are in all extant tetrapods. 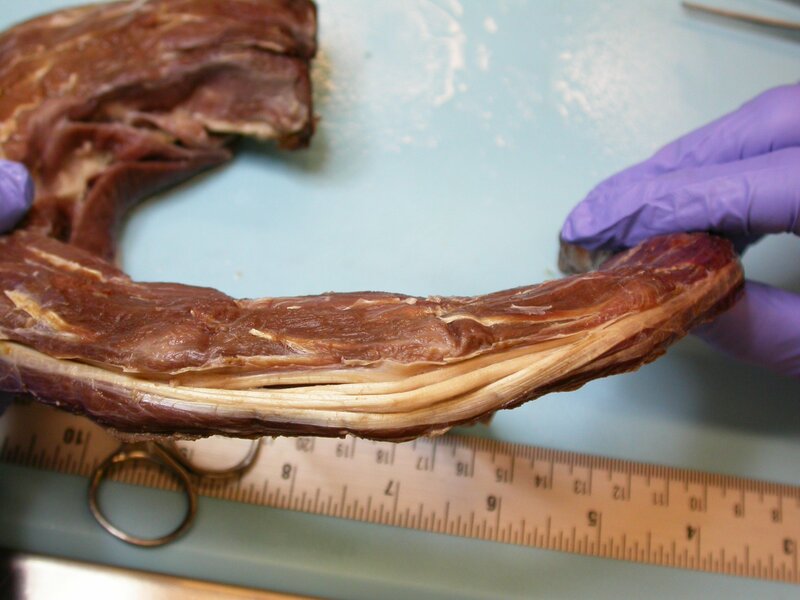 And outside of those single-segment muscles were long belts of flexor colli lateralis and cervicalis ascendens, which are also anchored by the cervical rib loops. All of these muscles are present in birds, and only vary in their degree of development in different parts of the neck and in different taxa. 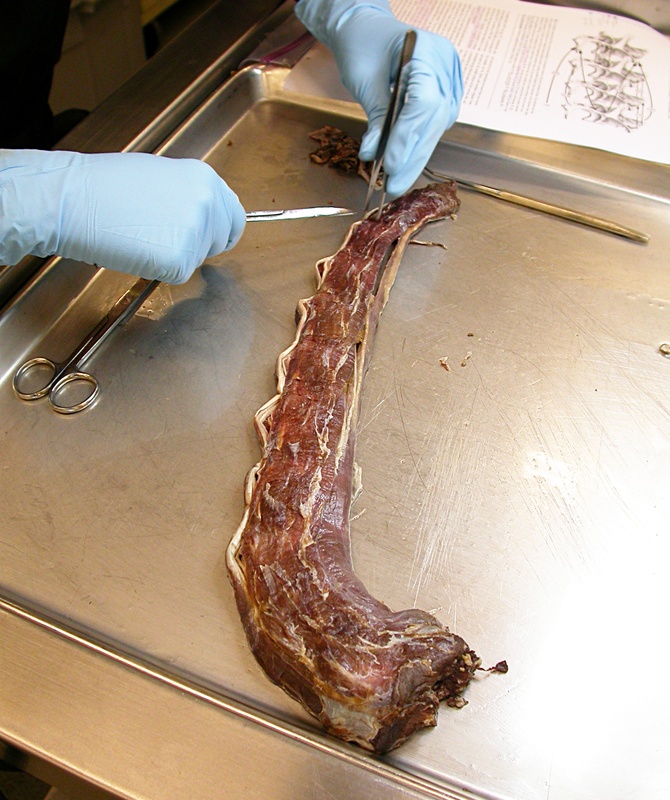 The spaces between adjacent cervical rib loops are not only not dished-in, they actually bulge outward, as in the turkey neck above. And we’re still not done; running up through the cervical rib loops, underneath all of those muscles, were pneumatic diverticula. Not just any diverticula, but the big lateral diverticula that carried the air up the neck from the cervical air sacs at the base of the neck to the vertebrae near the head end (diverticula are reconstructed here in a cervical vertebra of Brachiosaurus, from Wedel 2005: fig. 7.2). Now, it’s unlikely that the diverticula exerted any outward pressure on the lateral neck muscles, but they were still there, occupying space (except when the muscles bulged inward and impinged on them during contraction), and with the muscles they would have prevented the neck from having visible indentations between the cervical rib loops of adjacent vertebrae. The intensely pneumatic and very bird-like neck vertebrae of sauropods were much lighter in life than they look as mineralized fossils, and the skulls they supported were small. This suggests that the cervical musculature was also light and rather bird-like, just sufficient to properly operate the head-neck system. The bulge of each neck vertebra was probably visible in life, as is the case in large ground birds, camels, and giraffes. 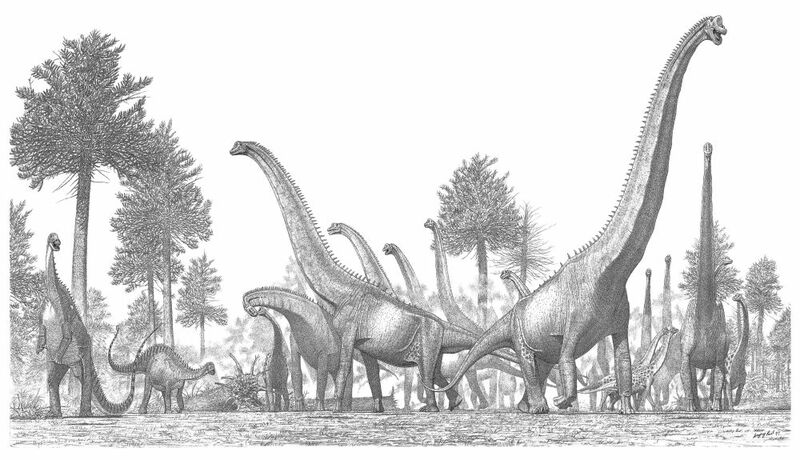 Paul has illustrated this in various iterations of his Tendaguru Giraffatitan scene; the one below is from The Princeton Field Guide to Dinosaurs (Paul 2010) and is borrowed from the Princeton University Press blog. There is much to discuss here. First, I have no qualms about being able to see individual vertebrae in the necks of camels and giraffes, and it’s not hard to find photos that show these. It makes sense: these are stinkin’ mammals with the usual seven cervical vertebrae, so the verts have to be longer, proportionally, and bend farther at each joint than in other long-necked animals. I’m more skeptical about the claim that individual vertebrae can be seen in the necks of large ground birds. I’ve dissected the necks of an ostrich, an emu, and a rhea, and it seems to me that the neck muscles are just too thick to allow the individual vertebrae to be picked out. 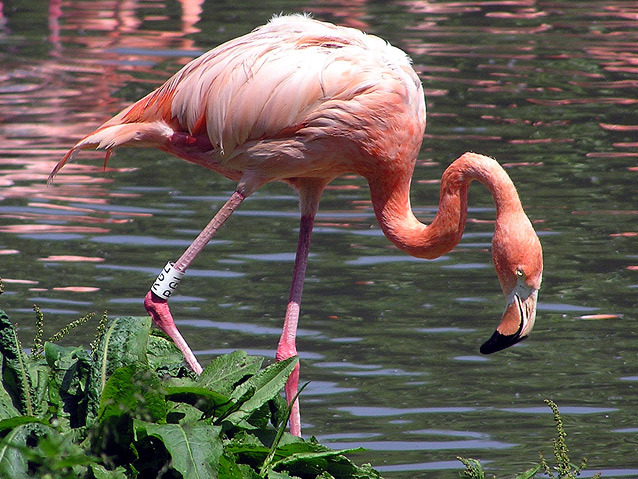 In a flamingo, certainly–see the sharp bends in the cranial half of the neck in the photo below–but flamingos have freakishly skinny necks even for birds, and their cervicals are proportionally much longer, relative to their width, than those of even ostriches. 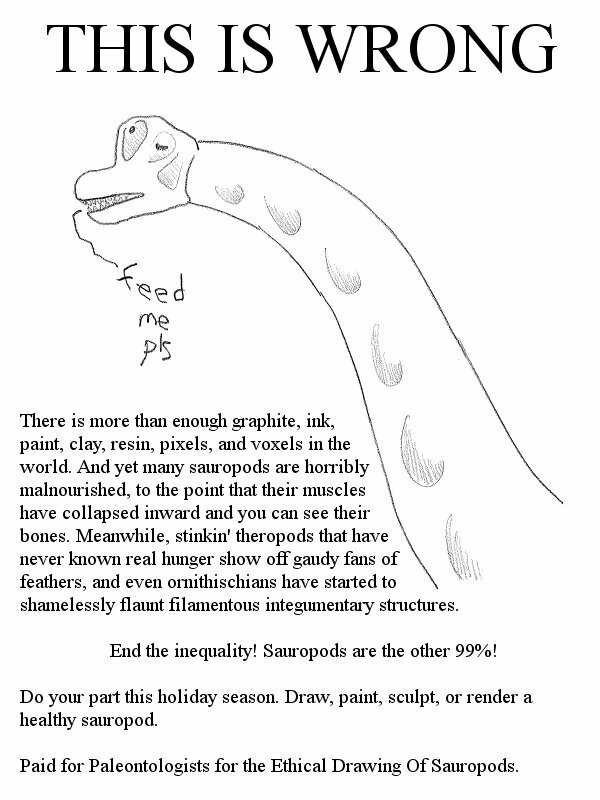 What about sauropods? As discussed in this post, sauropod cervicals were almost certainly proportionally closer to the surface of the neck than in birds, which would tend to make them more likely to be visible as bulges. However, the long bony rods of the cervical ribs in most sauropods would have kept the ventral profile of the neck fairly smooth. 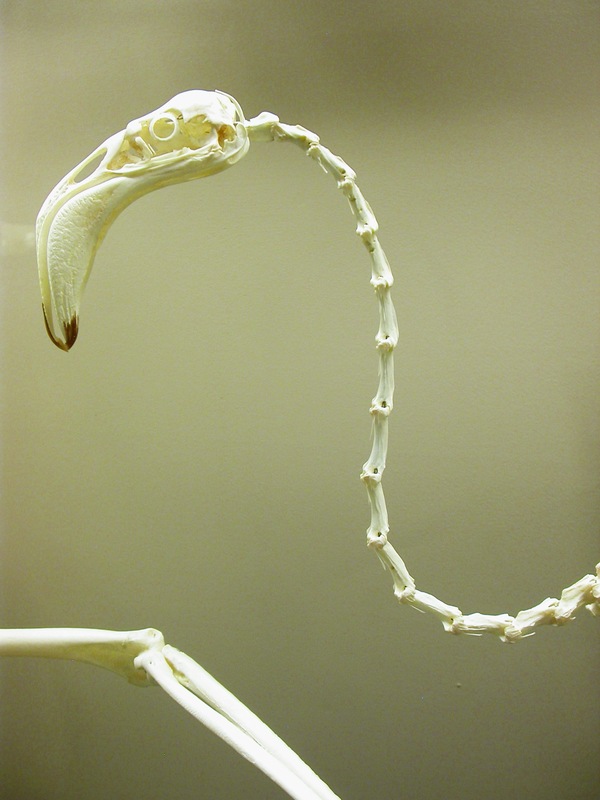 The ossified cervical ribs of sauropods ran in bundles, just like the unossified hypaxial tendons in birds (that’s Vanessa Graff dissecting the neck of Rhea americana below), and whereas the latter are free to bend sharply around the ventral prominences of each vertebra, the former were probably not. All of which applies to sauropods with long, overlapping cervical ribs, which is most of them. But as mentioned above, diplodocoids had short cervical ribs. Presumably they had long hypaxial tendons that looked very much like the cervical ribs of sauropods but just weren’t ossified. Whether the vertebrae could have bent enough at each segment to create bulges, and whether the overlying muscles were thin enough to allow those bends to be seen, are difficult questions. No-one actually knows how much muscle there was on sauropod necks, not even within a factor of two. There has been no realistic attempt, even, to publish on this. 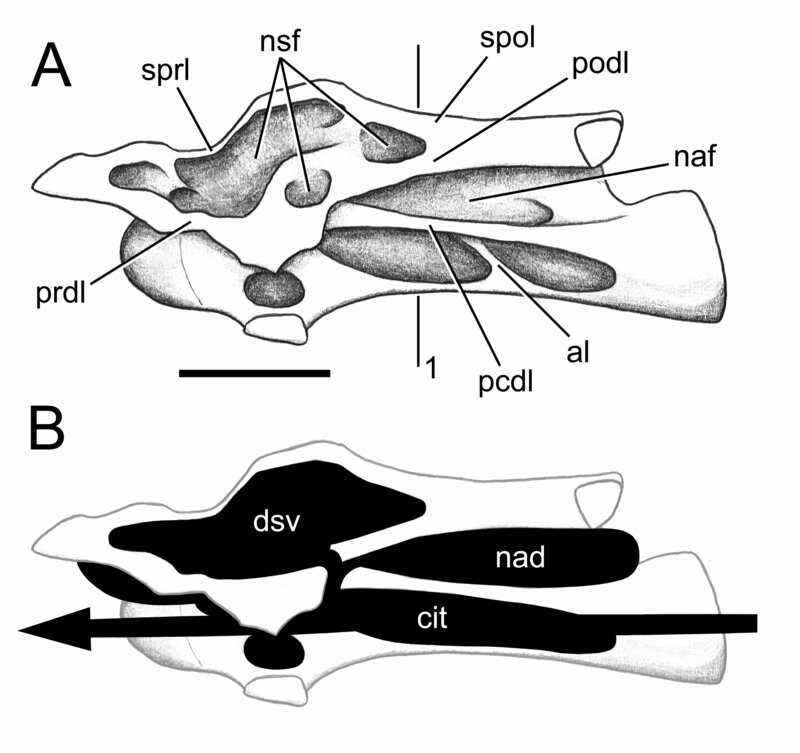 Published works on sauropod neck muscles (Wedel and Sanders 2002, Schwarz et al. 2007) have focused on their topology, not their cross-sectional area or bulk. 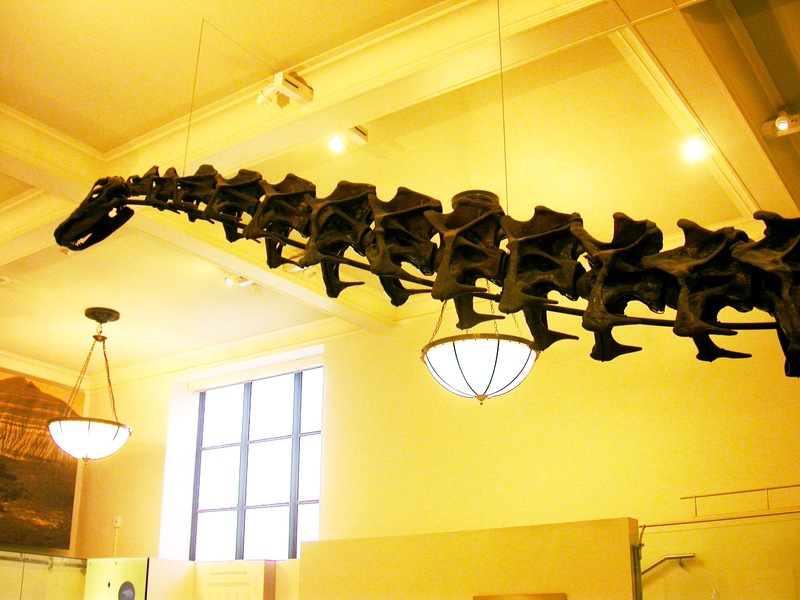 But then there’s Apatosaurus (AMNH mount shown here). If any sauropod had a chance of having its cervical vertebrae visible from the outside, surely it was Apatosaurus. And in fact I am not opposed to the idea. The cervical ribs of Apatosaurus are unusual not only in being large and robust, but also in curving dorsally toward their tips. 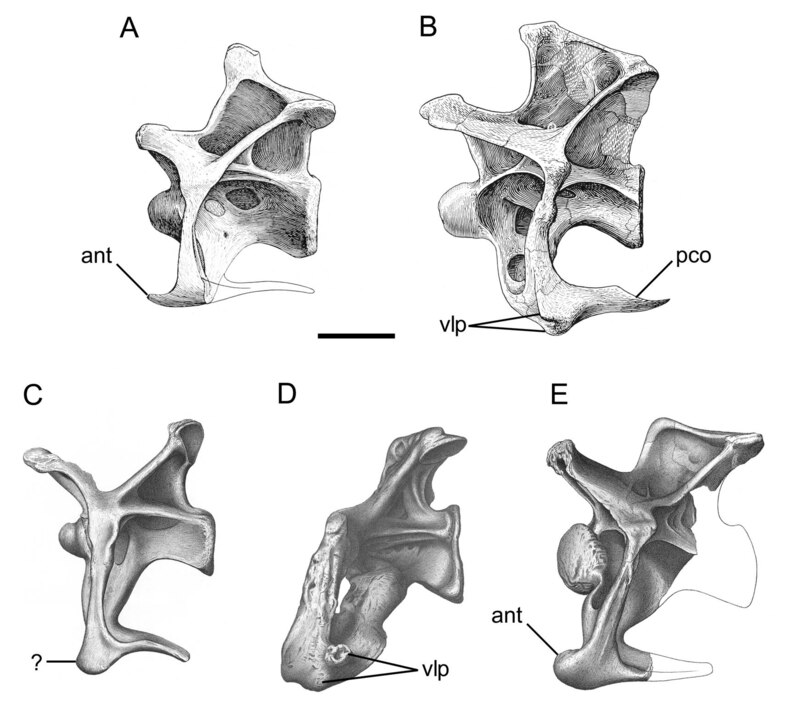 If one accepts that the cervical ribs of sauropods are ossified hypaxial tendons–which seems almost unarguable, given that the cervical ribs in both crocs and birds anchor converging V-shaped wedges of muscle–then the ossified portion of each cervical rib must point back along the direction taken by the unossified portion of the tendon. In which case, the upwardly-curving cervical ribs in Apatosaurus suggest that the muscles inserting on them were doing so at least partially from above. So maybe the most ventrolateral portion of each rib did stick out enough to make an externally visible bulge. Maybe. 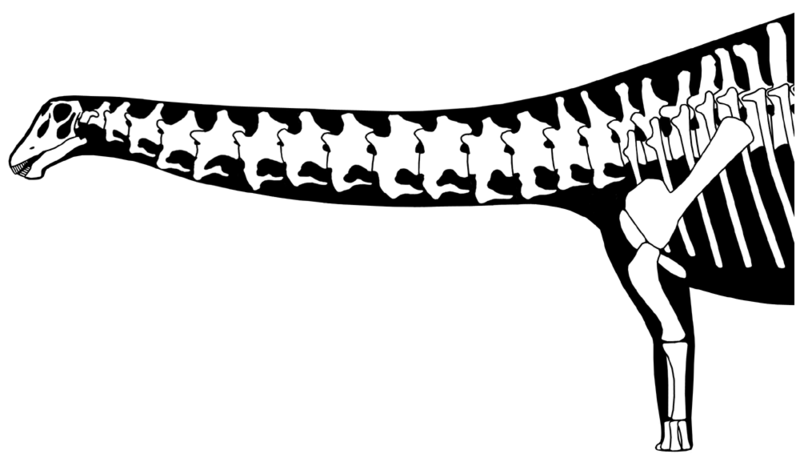 Many Apatosaurus cervical ribs also have bony bumps at their ventrolateral margins–the ‘ventrolateral processes’ or VLPs illustrated by Wedel and Sander (2002: fig. 3). If these processes anchored neck muscles, as seems likely, then even the immense cervical ribs of Apatosaurus might have been jacketed in enough muscle to prevent them from showing through on the outside. Still. It’s Apatosaurus. 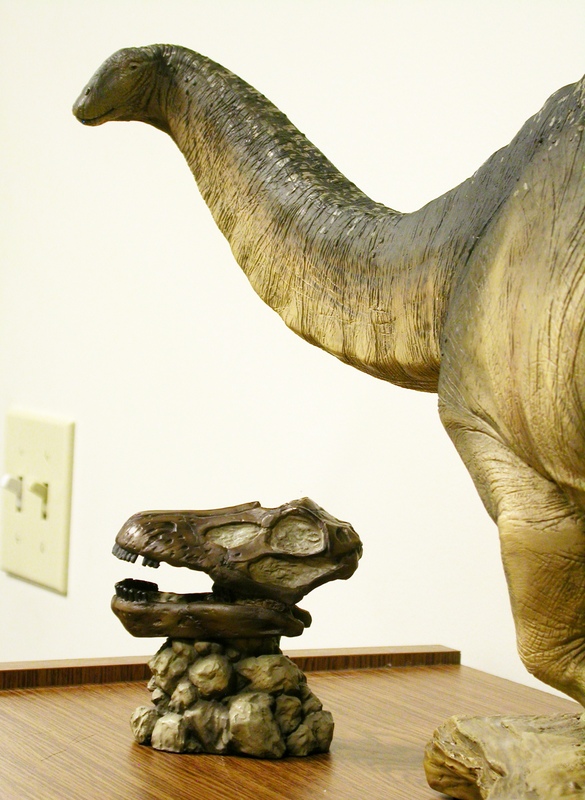 It’s simply a ridiculous animal–a sauropod among sauropods. If this were a model of Mamenchisaurus and it had visible bulges for the cervical rib loops, I’d be deeply skeptical. For Apatosaurus, it’s at least plausible. Because the cervical ribs are visible in the maquette as distinct bulges, it’s possible to count the cervical vertebrae. 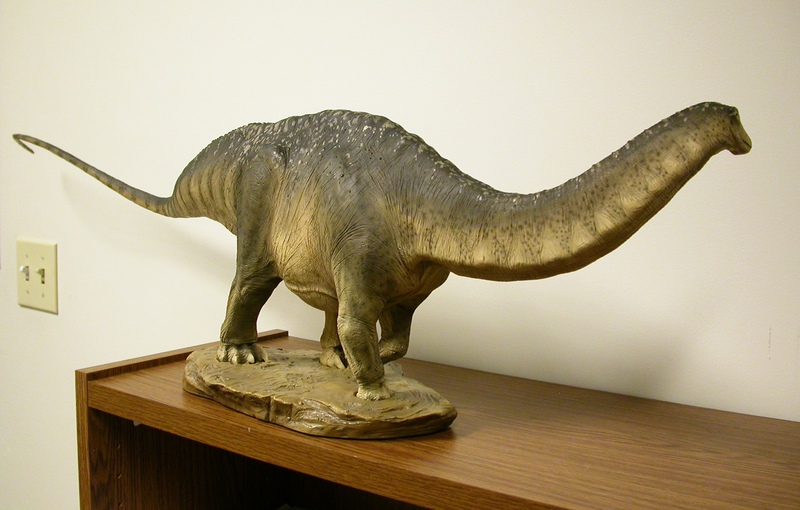 Apatosaurus has 15 cervicals, and that seems about right for the maquette. The neck bumps reveal 11 cervicals, but they don’t run up all the way to the head. This is realistic: the most anterior cervicals anchored muscles that supported and moved the head, and these overlie the segmental muscles and cervical ribs in extant tetrapods. The most anterior part of the neck in the maquette, with no cervical rib bumps, looks about the right length to contain C1-C3. Plus the 11 vertebrae visible from their bumps, that makes 14 cervicals, and the 15th was probably buried in the anterior body wall. In sum, the neck of the Sideshow Apatosaurus maquette gets the non-circular cross-section right, appears to have the correct number of cervical vertebrae, and looks weirdly fat, which turns out to be just right for Apatosaurus. The bumps for the individual vertebrae are plausible, and the maquette correctly avoids the dished-in, emaciated appearance–cocaine chic for sauropods–that has become popular in recent years. It manages to be eye-catching and even mildly disturbing, even for a jaded sauropodologist like yours truly, in that it confronts me with the essential weirdness of sauropods in general, and of Apatosaurus in particular. These are all very good things. Next time: as much of the rest of the body as I can fit into one post (all of it, it turned out). Paul, G.S. 1988. The brachiosaur giants of the Morrison and Tendaguru with a description of a new subgenus, Giraffatitan, and a comparison of the world’s largest dinosaurs. Hunteria 2(3):1-14. Paul, G.S. 2010. The Princeton Field Guide to Dinosaurs. Princeton University Press, 320 pp. Schwarz, D., Frey, E., and Meyer, C.A. 2007. Pneumaticity and soft−tissue reconstructions in the neck of diplodocid anddicraeosaurid sauropods. Acta Palaeontologica Polonica 52(1):167–188.